A few nights ago, we pulled out a random assortment of craft supplies and I started thinking of ornaments to make. 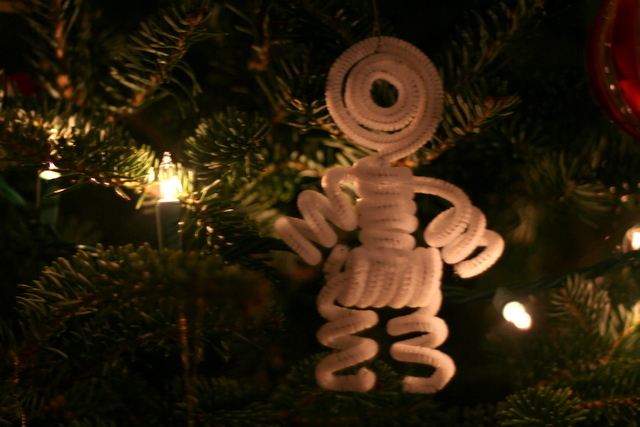 This guy started as a pipe cleaner twisted around a pen. I wasn’t quite sure what I was making until I added another pipe cleaner through the first and twisted the ends (now the legs). Obviously: a pipe cleaner man. He’s a little jiggly, and is hanging by an un-bent paper clip looped through his head. A whole troupe of these guys would be fun, in various colors. Too bad I already put the pipe cleaners away! This entry was posted in home dec. Bookmark the permalink.